Top 5 Challenges of Becoming a Screenwriter & How to Solve Them! We all have that moment in our lives, especially in times of transition, when we begin to rethink the decisions we’ve made and wonder if there is something more out there. That moment happened for me as I sat in front of my laptop at my university’s library, registering for classes for my last semester of college. I had always loved to write, which is why I chose journalism as a major. I loved reporting and loved working for the student newspaper, but I felt as though I hadn’t yet found exactly what I was looking for. As my time at college was coming to an end, my search for creative fulfillment was keeping me up at night. Now, with only a year of screenwriting experience under my belt, I am still clearly a beginner, and still trying to find my way through the challenges that every new writer faces. 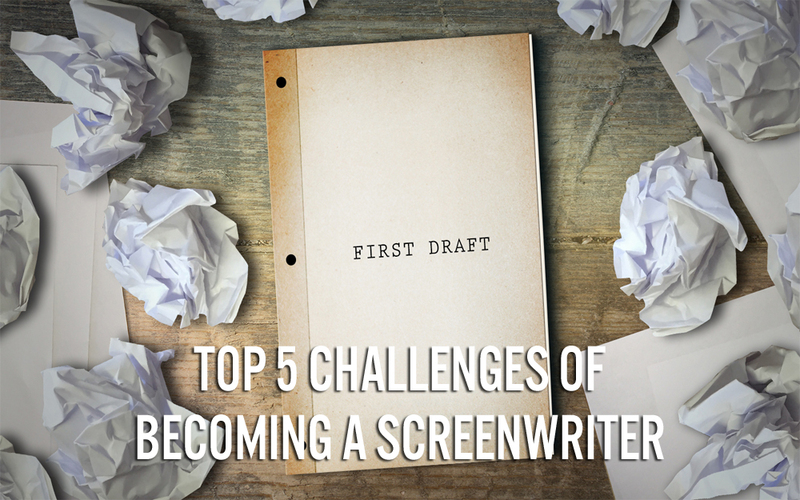 Here are five challenges I faced when moving into screenwriting and what I have learnt about how to solve them. Having the patience to plan. I have always been incredibly impatient, which made writing short stories the perfect way to express myself creatively. I would just start writing and see where it goes. That tactic doesn’t really work well in screenwriting, even when writing short films. While planning things out may not be too exciting, it’s necessary when it comes to good storytelling. Although it takes time and patience, planning and mapping things out can really make a difference with the final product. Never underestimate the power of a good outline. One thing that I struggled with when I first started writing, and something I still tend to have problems with is giving my characters mannerisms, quirks and feelings that are believable and unique. Basically, making my characters real. When starting out it can be hard to picture your characters as if they were in a movie, interacting with each other and showing real emotions. How would Harry physically react to what Maggie just said to him? How can you show what’s he’s thinking? One way to overcome this problem is to allow your characters to walk around with you in everyday life. When something happens that may be relatable to a character, asking yourself “how they would react to it?” This can help to round out your characters and have their lives exist outside of your story. The struggle with learning the right formatting almost goes without saying. It’s so important, yet it can be hard to grasp. Learning new things has never been something I’ve been good at, as my grades in high school and college can attest, but it’s easier to put time and energy into learning something that you are genuinely interested in. Like most things, the only answer to this problem is to study and to read other screenplays to see what the standard is. Learning how to prioritize writing while having a day job. I currently have a job in the journalism field, which can have unpredictable hours, making it hard to make working on my screenplay a priority. It’s too easy to get caught up with what’s directly in front of you and push everything else to the side. Even if you schedule time to write every day, it can be hard to get back into the story when you only have time to write a little bit at a time. It can be difficult not to lose the feeling of the story when there is so much going on in your life. As a reporter, I always carry around a notebook and a few pens, so I started carrying a second notebook to write down ideas for my screenplay while I was working. While not all ideas that you write down during the slow moments on the job are gems but by keeping the story in mind this will help you be productive when you’re finally able to find time to write. Gaining the confidence to throw yourself into something new. On my first day of the screenwriting course I was horrified to learn that we would have to write several short films during the semester, with the first one due by the end of the month! I immediately thought I made a mistake. I had just decided that screenwriting was something I wanted to learn more about, how was I already expected to write a short film that was good enough to give me a passing grade in the class? It seemed impossible. The idea of putting your all into something you’ve never tried before can be daunting, especially when you’ve decided that it’s important to you. For me, wanting something makes achieving or acquiring it much more difficult. But you must push through. At the end of the month I had written something that I was proud of, and the confidence I gained from that 10-page screenplay inspired me to keep writing. We all continue to learn and grow every day. Pursuing a new creative adventure and putting all you can into it is always going to be scary but being able to look back and be proud of the work you’ve done and be excited about what’s next makes every anxious moment of self-doubt and every challenge worth it. Keep Writing!